An Israeli missile is launched from the Iron Dome defense system, designed to intercept incoming rockets. This missile was fired from the southern Israeli city of Ashdod in response to a rocket launched from the nearby Palestinian Gaza Strip on Nov. 18. The scenarios of war between Israel and Iran all suppose that Iran would retaliate against Israel if it's attacked. And one way to do that would be via Hamas, its strategic partner on Israel's border. "Iran is the one that facilitated these weapons transfers into Gaza," she says. "They would arrive in parts and then they would train operatives in Hamas and Islamic Jihad in how to assemble them." It's been 20 years since Iraqi dictator Saddam Hussein launched Scud missiles against Israel. No adversary since then had fired on Tel Aviv, Israel's financial hub. But Hamas has now shown that it can do the same, delivering a powerful symbolic message to Israel. But that's just part of the story. The Israelis have a new anti-missile defense called Iron Dome. And they've been able to intercept and shoot down many incoming rockets. U.S. and Israeli defense analysts say this conflict has been a key test of the Iron Dome system, and they've pronounced it generally a success. Michael Rubin, a Middle East analyst at the American Enterprise Institute, says the outcome of this rocket contest may have provided insight into a future Israeli-Iranian conflict. "What many are going to be looking at, not only in Gaza City, but also in Tel Aviv and in Tehran, is the balance between these new, long-range rockets and Israel's ability to shoot them down," he says. Israeli officials are claiming they've shot down as many as 90 percent of incoming Hamas rockets that they targeted, though Rubin suspects the figure is less, in the range of 50 percent to 75 percent. In any case, some of those long-range rockets did get through. "Which means, in Tehran, there are probably some Revolutionary Guardsmen looking at this and thinking, 'OK, this is all well and good, we know how well the Iron Dome works now, so if we want to hit Israel five times, all we have to do is launch 10 rockets at it,' " Rubin says. The Israelis, on the other hand, can not only look at their anti-rocket defense; they can boast as well about how their air force was able to degrade the Hamas rocket arsenal on the ground. A major part of the Israeli preparation for a war with Iran would be to convince the Israeli people that they will be protected. Bhalla of Stratfor says it makes sense for the Israeli government to trumpet its success against the Hamas rockets. "Especially when it wants to calm its domestic audience, it needs to show that it's not going to continue to place these population centers under threat and that it's doing something about it," Bhalla says. "But there's the million-dollar question of how reliable is Israeli intelligence at this phase." Among the unanswered questions: How many of those rockets does Hamas still have? And will Iran be able to supply Hamas with more rockets, to replace those that have been fired or destroyed by Israel? Israeli calculations about how much of a threat these long-range rockets pose will be important in determining the country's readiness to go to war with Iran. And defense officials in Tehran are very likely assessing their ability to make Israel pay. Until today's cease fire, two parties were at war in Gaza. On one side, the Israeli military, on the other, Hamas. But a third interested party was no doubt watching closely, Iran, archenemy of Israel and a key ally of Hamas. Israeli leaders have threatened to strike Iran to block it from developing a nuclear weapon. NPR's Tom Gjelten reports now on what this Gaza fight may tell us about a possible Israeli/Iran conflict. TOM GJELTEN, BYLINE: The scenarios of war between Israel and Iran all suppose that Iran would retaliate against Israel if it's attacked. And one way to do that would be via Hamas, its strategic partner on Israel's border. Iran is believed to have given Hamas the weapon it needed to hit Israel, a long-range Fajr-5 rocket. One hit Tel Aviv yesterday and Reva Bhalla from the intelligence firm Stratfor says it's Iran that made it possible. REVA BHALLA: Iran is the one that facilitated these weapons transfers into Gaza. They would arrive in parts and then they would train operatives in Hamas and Islamic Jihad in how to assemble them. GJELTEN: It's been 20 years since Saddam Hussein launched Scud missiles against Israel. No adversary since then has been able to hit Tel Aviv. Hamas has now matched that feat. Israelis now have an idea what Iran could do to them via Hamas. But that's just part of the story. 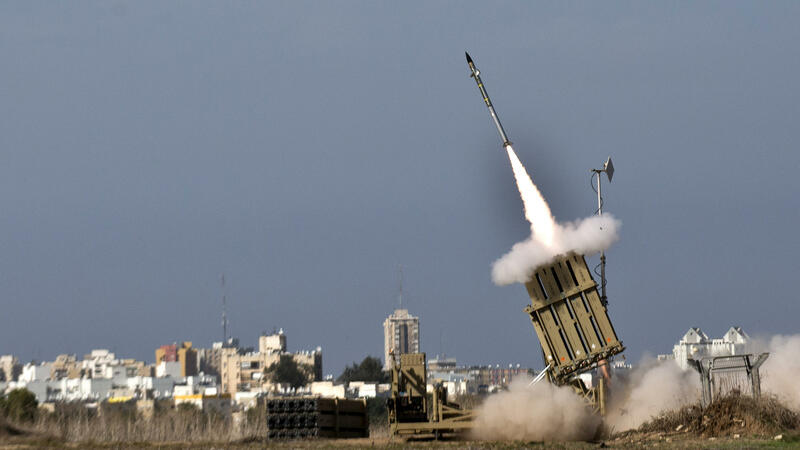 The Israelis have a new anti-missile defense called Iron Dome. And they've been able to intercept and shoot down most incoming rockets. U.S. and Israeli defense analysts say this conflict has been a key test of the Iron Dome system, and they've pronounced it generally a success. Michael Rubin, a Middle East analyst at the American Enterprise Institute, says the outcome of this rocket contest may have provided insight into a future Israeli-Iranian conflict. MICHAEL RUBIN: What many are going to be looking at, not only in Gaza City, but also in Tel Aviv and in Tehran, is the balance between these new, long-range rockets and Israel's ability to shoot them down. GJELTEN: Israeli officials are claiming they shot down as many as 90 percent of incoming Hamas rockets, though Michael Rubin suspects the figure is less, like 50 to 70 percent. In any case, some of those long-range rockets did get through. RUBIN: Which means, in Tehran, there are probably some Revolutionary Guardsmen looking at this and thinking, OK, this is all well and good, we know how well the Iron Dome works now. So if we want to hit Israel five times, all we have to do is launch 10 rockets at it. GJELTEN: That's the view from Iran. The Israelis, on the other hand, can look not only at their anti-rocket defense, they can boast as well about how their air force was able to take out much of the Hamas rocket arsenal on the ground. A major part of the Israeli preparation for a war with Iran would be to persuade the Israeli people that they will be protected. Reva Bhalla of Stratfor says it makes sense for the Israeli government to trumpet its success against the Hamas rockets. BHALLA: Especially when it wants to calm its domestic audience, it needs to show that it's not going to continue to place these population centers under threat and that it's doing something about it. But there's the million-dollar question of how reliable is Israeli intelligence at this phase? GJELTEN: Among the unanswered questions: How many of those rockets does Hamas still have? And will Iran be able to supply Hamas with more rockets, to replace those that have lost? Israeli Prime Minister Benjamin Netanyahu said today that'll be an issue during a cease fire.